I’ve been on the hunt for a pizza dough recipe that uses 100% whole wheat, instead of most multigrain crusts which always have a significant quantity of all purpose flour. I keep all purpose flour around for baking cakes and cupcakes, but for every day meals, I choose not to use it as it tends to wreak a bit of havoc on my stomach (sorry if that was TMI). I finally came across a recipe that seemed worth trying – no fancy techniques or extra effort and pretty similar to what I would do to make a standard pizza crust at home. As an added bonus, this recipe included adding ground flax seed as an option – an easy way to include flax into your diet. 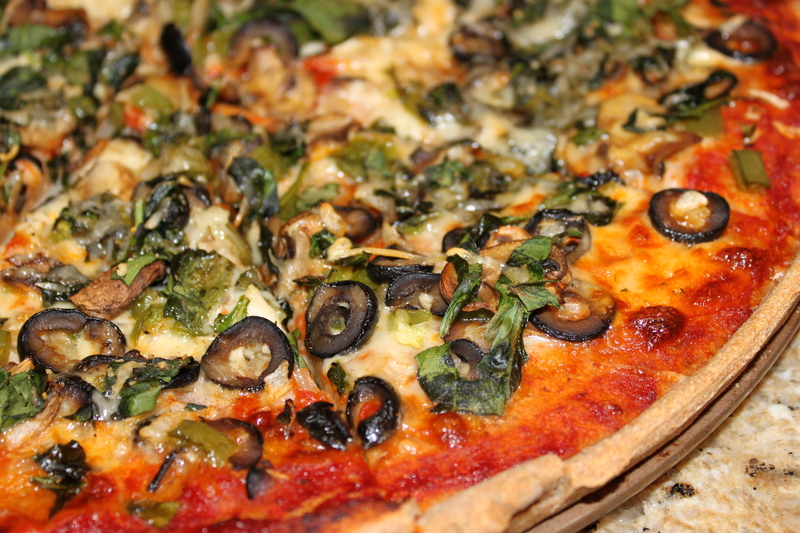 This recipe made two 14″ thin crust pizzas. Dissolve the honey into the warm water in a medium sized bowl. Sprinkle the yeast on top of the water. Set your timer for 10 minutes (if the yeast is active, it will foam up in 10 minutes). Once the yeast is ready, mix in the oil and salt. In a wide, shallow bowl, mix the flour with the ground flax. Slowly pour in the water and knead the dough into a ball. Cover the bowl with a towel, or instead, cover it with an inverted pizza pan (which is what I chose to do). Place the bowl in a warm area for a couple of hours to allow it to rise. My oven has a bread proofing setting which worked wonderfully. I’m sure you could warm up the oven to its lowest setting and then turn it off and use the residual heat to proof your dough (make sure you allow enough time for the oven to cool so it doesn’t cook the dough. I kept the toppings on the pizza fairly standard (mushrooms, green peppers, onions, olives, spinach) because the goal was to actually test the pizza dough recipe. The crust was definitely heartier and heavier than the usual all purpose flour version, but I’ve grown to like the texture of whole wheat foods and actually prefer them to heavily processed wheat. I personally think this recipe is best suited to a thin crust pizza, but you could definitely try making a regular crust with it as well. One thing I did splurge on was using Spring Hill garlic cheese curds along with mozzarella cheese on the pizza, which worked wonderfully! These curds are so delicious that it is going to be quite tough to not snack on the remaining cheese in a single sitting. This is awesome! We will try this at home.